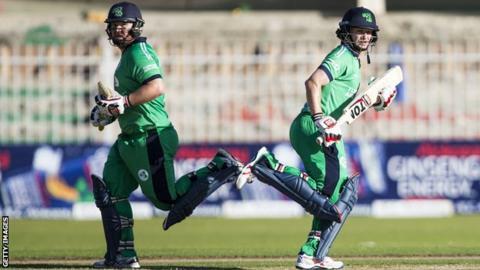 Paul Stirling struck his first century of 2018 as Ireland qualified for the Super Six stage of the World Cup qualifiers with a 226 run win over UAE. Stirling scored 126 runs from 117 balls, including 15 fours and five sixes, and built a 200-run opening wicket stand with William Porterfield. Ireland finished with 313 runs from a rain-hit 44 overs, leaving UAE with a revised target of 318 to win. Boyd Rankin took four wickets as UAE were bowled out for just 91 runs. Ireland's opening match of the Super Six stage on 16 March will be against Zimbabwe, who tied their final Group B match against Scotland at Bulawayo. After they were put in to bat first, the pair set a new Irish opening stand record as they combined for 205 runs before Porterfield was dismissed just eight short of his century. Stirling followed his captain back to the clubhouse just three overs later but Kevin O'Brien scored a half-century from just 26 balls as Ireland built an imposing total from their curtailed innings with 60 runs in the last five overs. Ireland's bowlers took wickets at a regular rate as they UAE run-chase failed to fire - just four of their batsmen managed to reach double figures with Ghulam Shabber top-scoring with 19 runs. Rankin was the pick of the Irish bowlers with 4-15 while all-rounder Simi Singh finished with 3-15 as the UAE were bowled out in 29.3 overs. "It's nice to come back from that West Indies loss and put in a good team performance," said Stirling. "I felt in good nick, it was good to go on and get a big score. I've worked pretty hard, so I'm happy I've been able to put in a match winning performance for the team." Following the match against Zimbabwe, Ireland will also play Scotland on Sunday, 18 March and against Afghanistan on Friday, 23 March. The top two teams from the 10-team Qualifier will take part in next summer's World Cup in England and Wales.